EDINBURGH limped to victory against Ulster in a final friendly warm-up before Guinness Pro12 action gets underway in earnest next Friday. In a game that wasn’t so much about the result as about individuals performing on the pitch, Edinburgh’s players passed the test, although the try count was even on the night, adding an Irish scalp to that of Romania from the previous week. Ulster finished fourth in last season’s Pro12, four places and 21 points ahead of Edinburgh, but it was the home side who mostly controlled the game after a sticky start and finished comfortably ahead and now look forward to the serious stuff, with Leinster first up. Last night Ulster started the livelier side, confining the hosts to their own half and putting the ball through the hands as they looked for a break in the defenisve line. But Edinburgh held out for the 15 minutes and on their first visit to the Ulster 22 came away with three points from a Nathan Fowles penalty. Ulster hit back instantly, with Stuart McCloskey making the break and international winger Tommy Bowe scoring the try. The conversion was wide. The substitutions began in the 24th minute, with Magnus Bradbury replacing Jamie Ritchie in the Edinburgh back row. The change was inspired because, within five minutes of coming on, Bradbury had scored beside the posts after the heavy duty lifting was done by the pack from a five-metre lineout. Fowles converted. Next, Edinburgh winger Tom Brown found some space on the right to run before Tongan Utolea Katoa went in for a second try on the left, with Fowles once again adding the extras. A flood of changes for the second half included Kiwi flanker Nasi Manu making his debut for Edinburgh, having lifted the southern hemisphere’s Super Rugby trophy with the Highlanders last month. Sporadic action was breaking out on the field, but there was little stucture to the play and clumsy pre-season handling didn’t help pacify a restless crowd realising that friendlies can be hit or miss affairs. 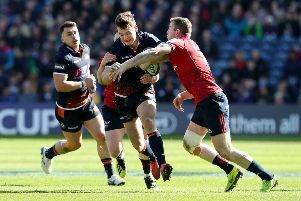 Both teams were dogged in defence but it was Edinburgh that looked the more likely to create something in attack with Damien Hoyland, just cut from the Scotland squad, in the thick of the fast and loose. But Ulster managed to turn the tide and Andrew Trimble scrambled over for a second try. The conversion was wide. With time running out, Edinburgh chose the safe option and Jack Cuthbert stepped up to boot over two simple penalties in the space of a minute to keep Ulster at a safe distance as the game petered out.